Red 5 Studios CEO would rather develop for the Ouya than mainstream consoles. Mark Kern is a familiar figure in the gaming industry. The former World of Warcraft lead and now-CEO of Red 5 Studios has been very critical of the state of consoles in the game industry, and he doesn't seem ready to change his position anytime soon. However, Kern may be making a cautiously optimistic exception for the Android console Ouya, which might actually have a chance of revitalizing the market. "For the price of the Kickstarter why not try it?" Kern said in an interview with Eurogamer. "Yeah, they may fail. Some people are saying 'oh, it's vaporware.' But I want to get behind people that want to challenge the status quo, who want to try something different. So I contributed personally at a level I was comfortable at and then my company contributed to at a level to get a dev kit and hopefully we'll see that and maybe we won't, but it's a risk that we take and it's for something better." Kern has previously stated his belief that the console development cycle was ultimately damaging to the industry, forcing teams to create triple-AAA smash hits or be doomed to failure. To Kern, a game like Minecraft would never have succeeded in the console market if it weren't for the Mojang's ability to take a risk with independent audiences. "Can you imagine pitching [Minecraft] to Sony?" Kern continued. "It's going to look all 8-bit. And it's going to have these cubes ...you bang on these cubes and you get something out of it and you combine it and you can make another cube.' They'll say you're insane. That thing would have never been greenlighted on a Sony or Microsoft platform." With increased competition from mobile devices and PC gaming undergoing a resurgence, Kern believes it's becoming harder and harder for consoles to justify the high costs of their development. "It's killing innovation because no one can take those risks anymore or try something new with those kinds of numbers," Kern explained. "I think that's bad for gamers and I think that's cripplingly bad for developers. And to be honest, I don't see Sony or Microsoft embracing the openness of the changes that are happening in the gaming industry right now." The Ouya currently has an incredible amount of support from the game development community, ranging from Kern's modest Kickstarter contribution to Robert Bowling's personal $10,000 donation. There appears to be a very strong hope that the Ouya will be a developer-friendly console allowing teams to experiment outside of the closed distribution channels that consoles usually provide. 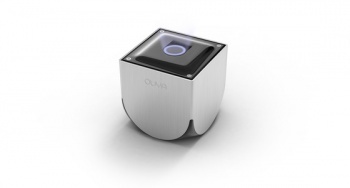 As to whether the Ouya can actually pull it off, we'll simply have to wait and see.